Stanley Roseman and the Ballets Russes: "The Rite of Spring"
The Bibliothèque Nationale de France conserves Roseman's dynamic drawing of star dancer Marie-Claude Pietragalla as the Chosen One in the Paris Opéra Ballet's revival of the Ballets Russes production of The Rite of Spring, choreographed by Vaslav Nijinsky to Igor Stravinsky's powerful ballet score. In the final episode of this famous work of modern dance, set in primitive Russia, a maiden is chosen from a circle of her peers and begins her "Sacrificial Dance'' to the pounding rhythms of the orchestra. The artist's vigorous pencil strokes evoke a visual sensation of Stravinsky's music and capture the kinetic energy and emotion of the star dancer in the terrifying climax of the ballet. The maiden leaps in frenzy, her legs bent under her tunic, her arms flung forward, until the tribe's exhausted, sacrificial victim collapses and dies. at a performance of The Rite of Spring, 1994. "I was filled with excitement on that eventful opening night, and my excitement remained through the subsequent performances by the Paris Opéra Ballet that April; again in 1994, when The Rite of Spring was reprised at the Palais Garnier; and still again in 1995, for the work's first performances at the Opéra Bastille." "On April 2, 1991, with my pencils and drawing book, I took my accustomed place in the wings of the stage of the Palais Garnier to draw at the opening night performance of The Rite of Spring. "The star dancers, premier dancers, and corps de ballet of the Paris Opéra brought their rigorous and athletic training in classical ballet - strengthened and reinforced under Rudolf Nureyev's tenure as Director of the Dance - to the renowned Company's presentations of modern and contemporary dance. The composer further recounts: "At the end of the Paris season I had a short rest at the sea, in which I composed two songs to Verlaine's words, and at the end of August I went to Switzerland with my family." In an Alpine pasture above Montreux, Roseman painted the breathtaking panorama Spring Evening - View of Mont-Pèlerin and Lake Geneva, (fig. 3). Stravinsky writes in An Autobiography that as early as 1910: ". . . I had a fleeting vision which came to me as a complete surprise, my mind at the moment being full of other things. I saw in imagination a solemn pagan rite: sage elders, seated in a circle, watched a young girl dance herself to death. They were sacrificing her to propitiate the god of spring. Such was the theme of the Sacre du Printemps. . . . In Paris I told Diaghileff about it, and he was at once carried away by the idea, though its realization was delayed by the following events." In his early career the eminent French-born conductor Pierre Monteux became a principle conductor of the Ballets Russes, and he enjoyed a close and amiable relationship with Stravinsky, whose ballet Petrouchka Monteux conducted for the world premiere in Paris in 1911. 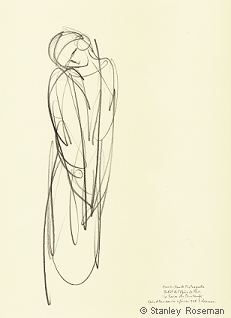 Drawing at the Paris Opéra's revivals of Ballets Russes productions, first conducted by Pierre Monteux in Paris more than seventy-five years before, had an added significance for Roseman. "Stravinsky's confidence in Monteux," writes Roseman about The Rite of Spring, "is expressed in the composer's autobiography: 'The complexity of my score had demanded a great number of rehearsals, which Monteux had conducted with his usual skill and attention.' Of the riotous world premiere in Paris on May 29, 1913, Stravinsky writes of Monteux: 'It is still almost incredible to me that he actually brought the orchestra through to the end.' "
The northeastern shore and hillsides that border Lake Geneva have been a creative milieu for generations of writers, composers, and artists. Stravinsky, like his esteemed compatriot Tchaikovsky, who in 1877 took up residence in the lakeshore village of Clarens, also gained inspiration for his work in the beautiful region of Lavaux in Canton Vaud. Stravinsky writes: "Before tackling the Sacre du Printemps, which would be a long and difficult task, I wanted to refresh myself by composing an orchestral piece in which the piano would play the most important part - a sort of Konzertstück. In composing the music, I had in my mind a distinct picture of a puppet, suddenly endowed with life. . . .'' Thus came into being the ballet Petrouchka. "The Rite of Spring, known equally by its French title Le Sacre du Printemps, was given its world premiere in Paris in 1913, with Pierre Monteux conducting. The Ballets Russes presented The Rite of Spring in five programs in Paris during May and June and four performances that summer in London. Thereafter, Nijinsky's choreography of the ballet was no longer included in further programs of the Ballets Russes, which was due partly to the estrangement between Diaghilev and Nijinsky as well as the choreography, controversial in its day. "The revival in 1991 by the Paris Opéra Ballet of the original choreography for The Rite of Spring and the work's presentation for the first time on the stage of the Paris Opéra generated great enthusiasm, not only from within the Company itself but also from the public and the dance world at large. Along the undulating coast lie the lakeshore towns of Montreux and Vevey and the villages of La Tour-de-Peilz and Clarens, where Stravinsky worked on the scores Petrouchka and The Rite of Spring. The Paris Opéra Ballet maintains in its repertory a number of productions of the Ballets Russes. 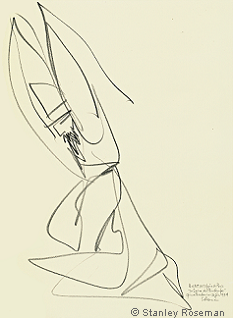 Roseman's drawings on the dance at the Paris Opéra include such celebrated ballets of the Diaghilev era as Petrouchka and L'Après-midi d'un Faune, presented on the preceding pages of the "Ballets Russes;'' and The Prodigal Son, on the website page "On Drawing and the Dance," Page 2 - "The Male Dancer. The revival of The Rite of Spring by the Paris Opéra Ballet in 1991 and its presentations over the followings years gave Roseman the wonderful opportunity to create an extensive series of drawings from that famous work of modern dance. "The Adoration of the Earth'' and "The Sacrifice"
8. The Rotunda of the Bibliothèque Nationale de France - Bibliothèque-Musée de l'Opéra featuring a spectacular display of Roseman's drawings from the Paris Opéra Ballet's presentations of original productions of the Ballets Russes. "Stanley Roseman's drawings show the many facets of his great talents as a draughtsman." The male dancer and the female dancer are equally represented in Roseman's oeuvre, whereas it is more often the case that artists who have taken up the subject of the dance in their work depict mainly the female dancer. For Roseman, The Rite of Spring provided fascinating stage personae of tribesmen in ancient Russia and the aggressive choreography of Nijinsky from which to create a series of superb drawings of the male dancer, as exemplified by a selection presented on this page. 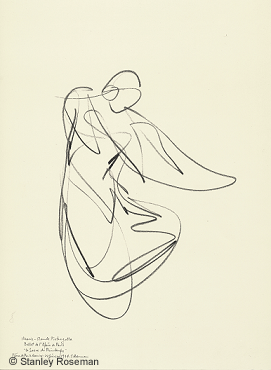 Male Dancer, 1994, (fig. 5), composed with a strong diagonal placement of the figure, is a dynamic image of a bearded tribesman rushing forward, his arms raised high above his head. Roseman depicts the patriarchal figure in profile with forceful, graphic strokes like chiseled contours of an ancient bas-relief. The triangular shape of the conical hat is repeated as a leitmotif in the description of the figure's raised arms and the heavy, belted tunic that falls in geometric folds over the dancer's legs. The Bibliothèque Nationale de France writes that Roseman's oeuvre on the dance "gives an answer to the challenge of expressing movement in a single pictorial image." Roseman draws the man's face with an effective economy of line; the beard, defined with staccato strokes of the pencil, adds a dark accent to the composition. The downward gaze is in dramatic contrast to the aggressive, forward movement of the figure, drawn with spontaneity and precision. Two Male Dancers, 1994, (fig. 4), is an impressive drawing of bearded Elders with arms thrust skyward as they move aggressively across the spacial dimension of the paper. In the context of the ballet evoking ancient Russia, the men depicted in the drawing wear heavy tunics and conical hats. The strong, diagonal composition reinforces the forward movement of the imposing figures. With a fluidity of nuanced pencil lines, accented by dark strokes, parallel hatching, and detailed rendering of the men's faces, Roseman describes the action and conveys the austerity of these tribal patriarchs. The Rite of Spring is divided into two parts, the total duration of which runs about thirty-six to forty minutes without an intermission. An Introduction, which begins with a haunting, bassoon solo in a high register, leads into Part I, titled "The Adoration of the Earth.'' A series of primitive rituals are carried out by the tribesmen and women from youth to old age, portrayed by dancers of the corps de ballet. Part II, titled "The Sacrifice,'' concerns the sacrifice of a young maiden, the Chosen One, who is forced to dance to her death. A selection of Roseman's drawings from The Rite of Spring was featured in the exhibition Stanley Roseman - Dessins sur la Danse à l'Opéra de Paris presented by the Bibliothèque Nationale de France on the occasion of gala reopening of the Paris Opéra, Palais Garnier, in March 1996, following a year and a half of refurbishing and renovation of the illustrious opera house. The three-month long exhibition was sponsored by Louis Vuitton. 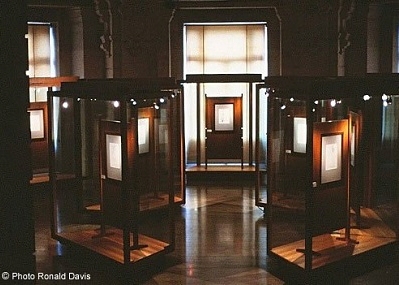 In the center of the Rotunda, Roseman arranged an exhibition space with vitrines that displayed a selection of his drawings from The Rite of Spring. Also exhibited in the Rotunda were drawings from Petrouchka and L'Après-midi d'un Faune. A further selection of drawings from classical ballet and works of modern dance complemented the artist's drawings on exhibition in the other galleries of the Museum. The distinguished President of the Bibliothèque Nationale de France, Monsieur Jean Favier, Member of the Institute of France, graciously opened the exhibition on the evening of March 12th. The artist had the great pleasure of personally escorting the President through the exhibition. (text in French and English), Marie-Claude Pietragalla, "Quelques Mots des Danseurs / A Few Words from the Dancers,"
(Paris: Bibliothèque Nationale de France, 1996), p. 13. 2. Igor Stravinsky, An Autobiography, (London: Calder & Boyers Ldt, 1975), p. 31. 7. Stravinsky, An Autobiography, pp. 46, 47. 8. John Canarina, Pierre Monteux, Maître, (New Jersey: Amadeus Press, 2003), p. 43. 9. Stanley Roseman - Dessins sur la Danse à l'Opéra de Paris - Drawings on the Dance at the Paris Opéra, p. 12. 11. Marie-Claude Pietragalla, "Quelques Mots des Danseurs," p. 13. 12. Bibliothèque Nationale de France, p. 12. 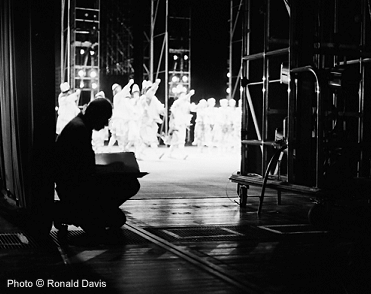 Parts I and II of the ballet are separated by a brief pause, with the curtain down for a change of scenery. "During the pause, while the set was being changed,'' relates Roseman of drawing at performances of The Rite of Spring, "stagehands with strings and sticks of white chalk made two concentric circles in the middle of the tarpaulin that covered the stage." Two Male Dancers, 1991, presented below, (fig. 6), is composed with a bold use of pictorial space in depicting the two crouching figures in a dance movement from The Rite of Spring. Combining fluid, strong strokes of a graphite pencil and wonderful, geometric abstractions, Roseman creates a compelling image of two male dancers in that celebrated work of modern dance. The young, pagan tribesmen, their heads bowed low and arms outstretched, touch the ground in their adoration of the earth. 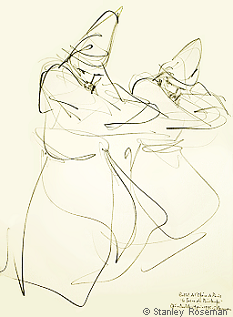 Two bearded Elders, participating in the solemn, spring ritual, are portrayed in the impressive drawing Two Male Dancers, 1995, (fig. 7, above). The tribesmen, similarly attired in heavy, belted tunics and conical hats, are hunched forward, their faces partially covered by their raised, folded arms. The effective mis en page establishes the perspective of the two figures in pictorial space. Roseman renders the figures with a gradation of pencil lines; dark strokes emphasize contours and accent the facial features. The two Elders, moving forward in unison with weighty steps and intense expressions, convey a collective tribal consciousness of the impending sacrifice. The present work, (fig. 9), poignantly depicts Pietragalla as the Chosen One having been thrust into the center of the circles, where she shivers with arms down, shoulders hunched, and head inclined in resignation of her fate. Roseman's drawings from The Rite of Spring, include a suite of magnificent drawings of Paris Opéra star dancer Marie-Claude Pietragalla as the Chosen One, exemplified by the drawing at the top of the page and seen again among the three works presented below, (figs. 9, 10, and 11). In the beautiful drawing Marie-Claude Pietragalla, 1994, (fig. 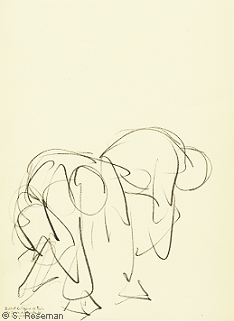 9, above), Roseman expresses a vulnerability in the slender figure drawn with nuanced, cascading lines and curvilinear strokes of the graphite pencil. Roseman's work, drawn at performances from the wings and in proximity to the dancers on stage, possesses a vibrant immediacy. With "a few magic pencil strokes,'' as Marie-Claude Pietragalla writes of Roseman's drawings, the artist depicts the star dancer in a forceful dance movement that typifies Nijinsky's choreography of the Chosen One's sacrificial dance. Marie-Claude Pietragalla, 1994, (fig. 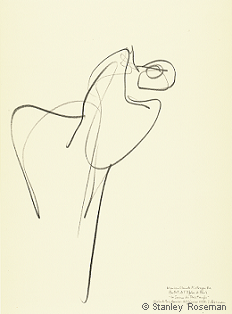 10), is an impressive drawing with subtle gradation of lines that evolve to dark contours accentuating the dancer's movement with her right leg raised high and bent at the knee, shoulders hunched, head inclined low, her left leg supporting the downward turn of her torso. The bodily contraction of the dancer and the sense of the gravitational pull of the earth anticipate the choreographic development of modern dance. Before the final episode of The Rite of Spring, the maidens who had been circling and taunting the Chosen One are joined by Elders who arrive to evoke the tribe's ancestors. The maidens retreat leaving the Elders to witness the spring sacrifice. In the "Sacrificial Dance," the final episode of The Rite of Spring, Stravinsky's pounding rhythms and Nijinsky's violent choreography express the cruelty of the pagan rite. 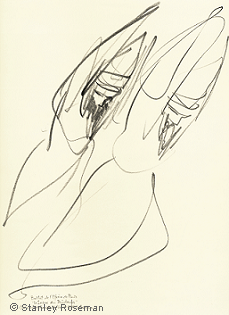 Roseman's drawing Marie-Claude Pietragalla, 1994, (fig. 11), evokes a visual sensation of Stravinsky's music and captures with vigorous pencil strokes on paper the kinetic energy and emotion of the star dancer in the terrifying climax of the ballet. Like a wounded bird, the maiden repeatedly leaps in frenzy. The vivid impression presented here depicts the Chosen One leaping with her legs bent under her tunic and her arms flung forward. In the final moments of the ballet the tribe's sacrificial victim collapses in exhaustion and falls to the ground and dies.